Finally announced just before the first Special Event caps hit the field (Jackie Robinson Day, April 15th) are this year’s batch of Special Events/Holiday caps and uniforms. This year features some new takes on what are now traditional events and an added cap for a new weekend holiday celebration. Since I’ve been waiting as long as you have, let’s get right to it. The Mother’s Day celebration continues into its 4th year of observance with this look, inverting the colorway from last year and allowing the pink to take up the logo and brim. Of note is the pattern on the brim; it’s not a flat shade of pink but rather varies with hints of darker pink hues within the pattern. It’s sort of akin to a tie-dye but not as severe. The uniforms will continue to only include a pink ribbon as they did last year. The era of pink lettering and designs seems to be dead…for now. New for this year is an Armed Forces Day celebration that will take up a 3 day weekend in May. The camouflage once seen for Memorial Day appears to have been shifted to this weekend with a new muted blotch camouflage design appearing on the caps. The uniforms will feature a patch similar to Mother’s Day (and by all appearances, every other holiday). The side patch on the caps feature 5 stars for each branch of the US military, while Toronto will be sporting a different patch (it being in Canada, after all). Memorial Day loses its camouflage and moves to a classier poppy look for the uniform patches. Caps have also been simplified to a circular patch. Given that Memorial Day is supposed to be a remembrance of those who gave their lives in active military service rather than a celebration of military members (that’s Veteran’s Day), this seems like a step up in every way. The red poppy has long been a symbol of Memorial Day remembrance, and I highly recommend reading up on why here. According to Chris Creamer of Sportslogos.net, neither the hats nor jerseys will be made available to the public for sale. Father’s Day will also be rolling into its 4th year of celebration with a blue “tie-dye” pattern similar to Mother’s Day save for the shade on the crown of the cap. It appears the teams had a choice for which accent color they wanted to use; the above shows the Giants using black instead of orange (which is probably for the best) and St. Louis using their usual red. The uniforms will also feature a blue ribbon patch; blue is the color for prostate cancer awareness. 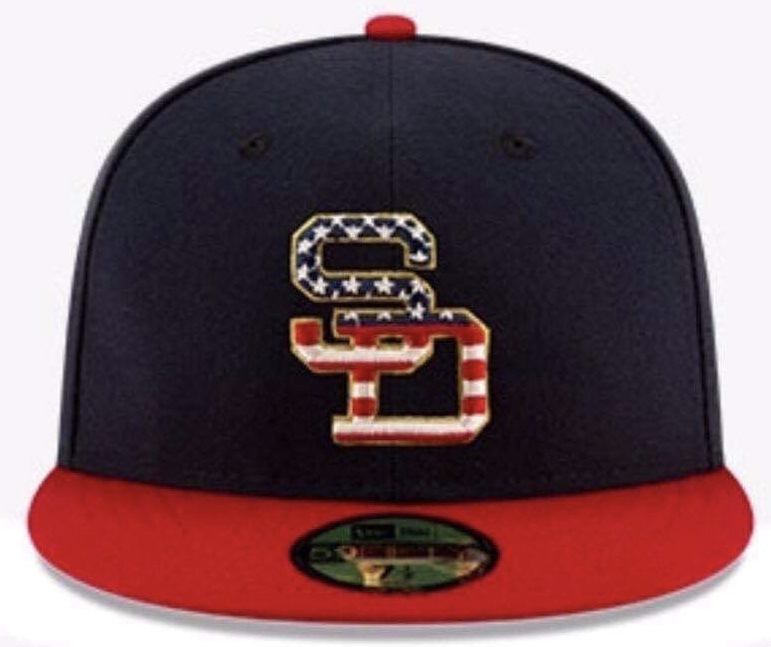 The Stars and Stripes cap is the longest-running Special Event cap of the bunch and kicked off the whole alternate uniform for holidays theme way back in 2008. Going into its 11th year, the Stars and Stripes will dig into individual team’s logo catalogs and feature them in flag embroidery (the same as last year) on the front of the caps. Some teams never changed logos, so their cap will look…the same. Crown and brim colors are team’s choice. Uniforms will include a simplified patch and Toronto will feature their own unique look for Canada Day on July 1st. The side patches will continue to be league-affiliated depending on the team. Chris Creamer makes an eagle-eyed observation in this photo and notes that the Batterman logo appears to be the Cooperstown Collection logo (the batter is wearing a different “pillbox” hat). Formally known as the “All Star Home Run Derby” caps, the second of the All Star Game set is now known as the “Workout/Media” cap and is worn generally throughout the ASG festivities by players and sometimes during the HR Derby itself, though this depends wholly on the player. This year’s motif features a graphite crown and either a red or navy brim and logo. National League teams get navy while American League teams get red. The respective jerseys will be sleeveless. I’ll be honest, I think the navy/graphite is a bit of a miss. The colors are meant to mimic the colorway of the hosting Cleveland Indians, but the navy does not stand out at all against the already muted graphite. The red/graphite does a far better job. The inclusion of white on some caps helps the look out a bit, but it doesn’t show up on every cap. Ouch. The All Star Game caps feature a really nice piping detail across the panels of the cap save for the front, which features the respective team logo flanked by stars. Players who play in the All Star Game will wear their own jerseys with an added patch featuring the number of All Star Games the respective player has played in. What do you think of this year’s batch of caps? Do you have a favorite or a cap you need for your rotation? Special thanks to Yahoo Sports for the first look and as always to Sportslogos.net for the excellent pictures and in-detail commentary!